Barnes and Noble's Nook ebook reader might have made an unexpected debut a little earlier than planned today, but it's all official now. The Nook has a six-inch 16-level E-ink screen with a color touchscreen underneath for navigation and settings, and -- it's running Android! You can lend a book to a friend, and there's wireless on AT&T's 3G network as well as WiFi -- everything we saw earlier today. Pre-sales are live now at $259, and it'll be shipping in November. All B&N stores will soon be getting a big crazy display unit that showcases the device and a number of cases from all sorts of designers. And what's more, Nook owners can connect to B&N WiFi and browse complete ebooks in-store for free -- just like a real book. That's pretty great. 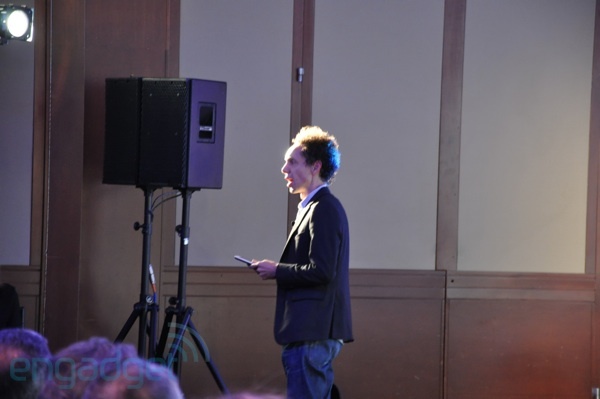 Update: Malcom Gladwell is on stage, talking about syphilis in Baltimore. People are clapping -- it's a little odd. But the first Nook buyers will get a free copy of The Tipping Point, so that's nice. Update 2: "Ladies and gentlemen, the bar is now open." That's all for now -- we've got a Q&A session coming up, we'll let you know what we find out after the break. Update 3: Barnes & Noble just pinged us to say that they were wrong during the event -- the Nook's WiFi will work anywhere, not just in-store. They like Android, but they're not doing open app development -- they just like the optimizations for the small screen. It sounded like apps are a possibility, through. There's no browser, they think E-ink browsing is clunky. 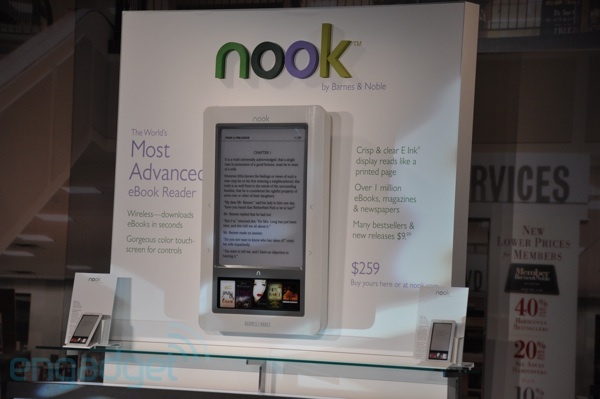 The Nook has 2GB of built-in storage, but there's an SD slot as well. The WiFi will only work in Barnes & Noble stores at launch. The in-store book browsing doesn't download books, it "streams" them. Uh, sure -- we'll see about that. The screen is capacitive touch -- "just like the iPhone." They're looking at an actual Android app for the future, no commitments made. Nook will mount as mass storage over USB. Only some books can be lended, and they'll be branded with a LendMe logo on the ebook store. It's up to the publishers, but B&N says they're working to enable as many as they can. They plan to support Windows Mobile in the future.